Timing, as always, can be tricky thing. Here I review another rock band from Spain (see my review of Eldorado elsewhere). Airless is a more traditional melodic hard rock band with a guitar rock foundation in well-known Spanish guitarist Robert Rodrigo. 'Fight' is their third album, the second with Lion Music, and will prove a delight to melodic rock fans everywhere. With all this praise, there are some thin moments on 'Fight.' Specifically, on 'I Don't Need Your Words' and 'One Last Kiss,' the melodic hard rock becomes a bit too traditional. The former is redeemed by the solid bass line and overall rhythm section and the latter by Lazkano's superior vocals; otherwise, Rodrigo drops the ball here as his fret work is muted and uninspiring. 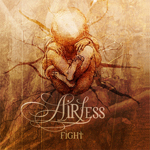 Though some will be quick to say Airless' 'Fight' is more of the same European melodic rock, I ask where else will you find it being done better? Whether it is the shamelessly 80's style of 'Switch Off The Light' or the quirky vocals and imaginative arrangement of 'Blame The Darkness, Part II, 'Fight' is filled with lively and entertaining rock, a pleasing contribution to the genre. Very recommended! Though some will be quick to say Airless' 'Fight' is more of the same European melodic rock, I ask where else will you find it being done better? 'Fight' is filled with lively and entertaining melodic hard rock, a pleasing contribution to the genre.